FAMILY INFO: Born to parents Yulia and Vladimir Yurchenko. In 1988, Natalia married Igor Sklyarov a professional soccer player and 1988 Olympic Champion. Together they have one daughter: Olga (born 1989). RESIDENCE: Chicago Illinois, USA where she owns a premier gymnastics training facility, C.I.T.Y. Club Gymnastics Academy, and is the head coach of Team Yurchenko, the girls’ USAG Junior Olympic program. Natalia Vladamirovna Yurchenko was born January 26, 1965 in Norilsk, Russian (North Siberia) to parents Yulia and Vladimir Yurchenko. Natalia started gymnastics in 1972 at the age of seven after following her friend to a local gym. Her coach, Galina Khasanova noticed something special in Natalia and decided to take her to a famous gymnastics club located on the south side of Russia – Rostov-on-Don to show her to Vladislav Rastorotsky who was known for developing world class gymnasts such as Ludmilla Tourischeva and Natalia Shaposhnikova. In 1976, Natalia was accepted to be a member of the Dinamo Sports Society and to the Rostov-on-Don’s Boarding School for Athletes. Natalia showed tremendous progress over the next two years and was appointed to be a national team member. While not even age eligible, she started traveling as an alternate for the national team and attended the 1978 World Cup and 1979 World Championship to be shown to international judges (alternates from World teams would perform in training judging sessions right before the real competition would begin). Natalia’s first international competition was in 1978 at the Junior Friendship Tournament where she placed 5th all-around and won a gold medal on uneven bars and in the team competition. That meet was the turning point in her career as it was the first time she did not fall off the beam in a major competition and her coach began to really believe in her big future in gymnastics. In 1978, she also debuted at the senior Riga international meet where she won the bronze medal on floor. In 1980, Natalia was injured and it took her more than a year to get back to compete again. She and her coach decided to go back to competition only when she would be ready to be the best. So, they worked really hard on creating new routines, new elements and signature moves. 1982 was when her success started. She won all meets of the season including the USSR Cup and USSR Championship and earned a spot to compete at the World Cup. There, she tied for the title with her teammate Olga Bicherova and also tied for first on vault, won balance beam and took second on bars. In 1983, Natalia won the all-around title at the World Championships and defended her title at the USSR Championships. At the 1983 USSR Championships, she also won gold on vault, bars and beam and took second on floor. She won the World University Games in the same year with a gold in the individual all-around, team, vault, bars and beam. Unfortunately, at the end of that year, she got a bad knee injury and suffered for almost six months. She was working really hard to get back to her best shape for the 1984 Olympic Games, but, was unable to compete due to the USSR’s decision to boycott those Olympic Games. Instead, the Soviet team competed in the Friendship Games where Natalia won the gold medal on vault along with the team gold medal. 1995 marked another triumph. Natalia won gold in the all-around individual competition, bars and floor at the World University Games as well as winning the gold medal in the team competition at the 1985 World Championships. In 1986, after retirement, Natalia worked as an assistant coach to Vladislavar Rastorotzky developing new young gymnasts. In addition, she started judging major competitions. She was a judge for all big events held in the USSR: USSR Championships, Cups and International tournaments including the Junior European Championships. In 1988, Natalia married Igor Sklyarov a professional soccer player and 1988 Olympic Champion. They lived in Moscow after marriage where Igor played for top club Dinamo. In 1989, Natalia gave birth to daughter Olga. From 1991 – 1994, Natalia was a member of the gymnastics show of Mikhail Voronin, performing at different events around Europe. In 1999, Natalia, Igor and Olga moved to the United States. The primary reason was to raise their daughter Olga in a stable society and provide her with a good education which was problematic in Russia at the time after the USSR collapse. Natalia and her family settled in Allentown, PA where she worked at Lehigh Valley Sports Academy. After eight years of successful work for LVSA, she moved to Parkettes where she coached for the next three years. In 2012, Natalia moved to Chicago where she worked to build a new girl’s competitive team at Lakeshore Academy of Artistic Gymnastics. 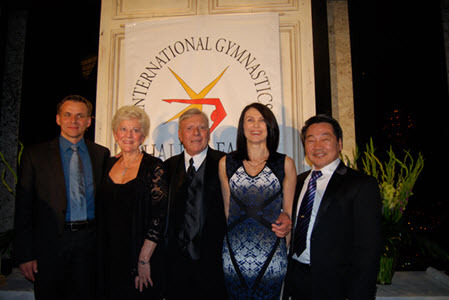 On May 17, 2014, Natalia was inducted into the International Gymnastics Hall of Fame in Oklahoma City, OK, USA along with Jackie Fie, Klaus Köste and Li Yuejiu. At the induction ceremony, it was said of Natalia…. Amid her performances, hypnotic for their unhurried beauty, she would calmly turn daredevil. Her trademark refinement would give way, momentarily, to reckless abandon, often leaving audiences stunned. On balance beam, for example, she was the first to execute the unthinkable Yurchenko loop, a sideways back handspring to back hip circle. On vault, she introduced the roundoff-entry onto the board, the most common vault technique today. These rare, paradoxical performances led to her biggest victory, the all-around gold at the 1983 Budapest World Championships. In June of 2015, Natalia opened her own premier gymnastics training facility, C.I.T.Y. Club Gymnastics Academy, and is the head coach of Team Yurchenko, the girls’ USAG Junior Olympic program. Through her own facility, Natalia is now able to fully bring her unique style and philosophy to Chicago and Illinois. She really enjoys her group of young talented gymnasts and is working toward another of her many dreams – going to the Olympics – this time as a coach. And, in late 2015, Natalia launched Yurchenko Gymnastics with the mission to provide top quality gymnastics apparel, accessories and equipment to today’s competitive gymnasts.